Lemmings are actually very small rodents that live in Northern Europe. Every so many years an unusual event happens: The Lemmings population explodes and grows to immense proportions. At this time, the multitudes travel across vast spaces of land oblivious to any danger that may confront them. The Lemmings' only concern is to migrate forward, each following the next. Where are they going you ask? In an almost hypnotic state, they plunge, by the thousands, mindlessly into the sea towards certain annihilation. This is your chance to play a part in a natural phenomenon and possibly help solve a puzzle which has baffled researchers for years. lem-ming (lem-ing): adorable yet incredibly stupid furry creatures, lost in a maze of confusion. Known for walking off cliffs, wandering aimlessly into dangerous passageways and drowning by the thousands in small pools of water. Without your help, they have no chance for survival. Lemmings may be mindless but are luckily equipped with special skills that you must assign to them so that they can travel safely through many dangerous terrains. An experienced player will know precisely where and when to assign these skills to the token Lemmings who will build a safe path towards an exit and save the rest of their buddies. Your success is measured by the percentage you save. It will take all your brain power to rescue as many Lemmings as possible from impending doom! As you see hordes of these cute little fellows march to their sad fate, a guilty conscience is not the only thing you will develop--it's sure to become an addictive obsession! --From the SNES Lemmings instruction manual. Lemmings are suicidal little fuzzy creatures. Their complete life's ambition seems to be finding a cliff to walk off. This is certainly their last life's ambition, because once they find one, they walk right off. 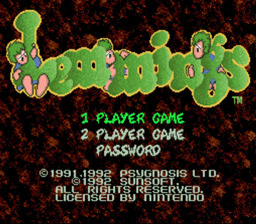 Anyway, in Lemmings the game, your job is to save them from themselves. Using their various skills, guide them over and around obstacles and through the exit door, before time runs out and before they all walk off somewhere you don't want them to, i.e. to their doom.